Congratulations! 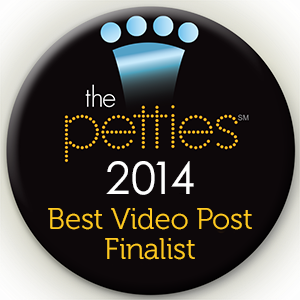 Your blog is a finalist in the 2014 Petties category for Best Video Post. I have attached the 2014 Petties finalist badge for your category. Voting for the 2014 Petties will begin later today. We are currently working on setting the voting page live. Voting will continue until July 31st midnight PST. I will be reaching out again soon to get more information from you. Congratulations again! Please let me know if you have any questions. To be honest, I found out about it from some friends on Facebook before I even received the email. So it should come as no surprise that I found out from the same friends that there was a new "complete" list of finalists. A "complete" list of finalists that was kind of missing some of the original finalists. I never did get a follow up to the original email telling me the first email was sent in error. What I got instead was a blanket "Hey yeah, sorry for the confusion, here's the real list." When I was first told we were nominated for a Pettie in the "Best Video" category, I was psyched. I've made a few videos, worked my tail off to do so and thought, "Hey, that's cool that someone nominated us." I still think it's very cool that someone somewhere out there thought enough of us to nominate us for one of these awards. I really do. But when I went out to see which video made the cut, I was more than a little confused. The video that we were up for was hardly worth the nod. So I guess I wasn't really too surprised when I found out that the first email about being a finalist was sent in error. And I'm REALLY glad I didn't rush out to tell you all about it. However, some of my friends who were on the original list of finalists and weren't on the revised list are big-name and popular blogs who had every reason to believe they were appropriately nominated as noted in the first email. Kol's Notes, The Writer's Dog and Dog House Adoptions, Oz the Terrier and Pawcurious all deserved to be on that list and believed DogTime when they told them they were finalists encouraging them to recruit their followers to come out and vote for them. When the "complete" list came out and they weren't on it, they had every right to be angry and embarrassed for asking their followers to go over and give DogTime the traffic. And they never even received the slightest hint of an apology from DogTime for the mix-up. I feel bad for everyone involved. But here's the thing with my nomination. The video that made the selection for us didn't even make sense. I barely edited it, never mind slaved over it as folks who make good videos do. I knew something was wrong. I wasn't going to ask you all to vote for us because I was embarrassed by the video that ended up on that finalist list. It would have been nice to get that recognition. It would have been even nicer to get the prize money for Save a Sato had I won. But I wouldn't have won with the video that was nominated and the folks who are in the finalist list deserve to be there where I did not. Truth is, I had a video do everything I've ever wanted earlier this year - it went "viral". Well okay, it went "viral" in parts of the the scared-y dog community anyway. But really, no award can compete with how it feels to hear from folks who have been encouraged to keep working with their fearful dogs because they've seen evidence that these dogs can succeed in overcoming their fears. If I had a choice, this is the video I would have submitted to the Petties for 2014. Who knows, maybe I'd have given some of the real finalists a run for their money. Bella was afraid of sticks and poles not to mention the clicker so we literally started with just a stick on the floor encouraging her to come into the room. She made this video and it's better than anything I could have ever done on my own. There isn't an award in the world that can make me more proud of this crazy dog than what's in that video right there. "The Petties, DogTime Media’s annual awards show recognizes the best of the pet blogging community. Through this program, DogTime has donated over $50,000 to shelters and rescues across the nation. In addition to bloggers, the Petties honor nonprofit organizations and volunteers who have dedicated their lives to helping homeless animals." Bringing up Bella extends our sincere congratulations to all the 2014 Petties Finalists. Good luck to all! That is a wonderful video! Well done to you, Jan and Bella. It's a great team effort. I have no idea about the Petties debacle, but it sounds very unprofessional. We had never heard of the Petties until this year (we live under a rock sometimes) and we feel so bad for this big mix up. It sounds like it wasn't handled well. Thanks for sharing this video, it is great. Loved the video of Bella. :) What a weird story about the Petties. Oh well! Aw, Leslie, you had me choked up by the end of the video. How beautiful, touching, sweet, inspirational....what a fabulous video! And even more so, what an example you and Jan have set for how much we can help and improve the lives of Satos and dogs like Bella! That Petties mix-up was awful for everyone involved. But you're right - there's NO award better than watching Bella learning to jump. Brilliant! Such a brave girl. That's an amazing video. I have a certain soft spot for fearful dogs. You've done great work with her. I love her face, she seems so confident towards the end, and happy. I'll be voting for my hard-working friends who remain on the voting list but the Petties awards have left a bad taste in my mouth. First, for their poor handling of the nominations. And second, for having a company who specializes in shock collars and electric fences in the running for best pet technology. Really, people? Thanks for reminding me of your awesome video. It made me so happy to see it. I'm off to share it again. We are very glad you're still on the list, friends. And we're very happy for all of our friends who made it to the finals. It's a great accomplishment. Good luck!! Thank you, Jen. I've come to have a particular soft spot for them myself. This is my first dealing with one and it's been a real learning experience. Thanks. Who'd have thought jumping would present such a learning curve for a dog? LOL She has come a long way. I heard that someone's video was totally random and suspicious. I just didn't know it was you. I wasn't shocked to see any of the blogs on the first finalist list either. It's too bad all of this was handled so poorly. Ouch. I didn't realize I was part of the chatter. Still would have been nice of DogTime to follow up personally with folks who didn't make the second cut. That is a wonderful video and something to be very proud of for sure!! I don't know much about the Petties awards, though I did go on and make some nominations this year. I just think they could have done something special for the people that were originally on the list and then had it taken away. Amazing video! Bella has certainly come a long way! Your video is a testament to how far you've come. Great job!! The Petties, well I have nothing nice to say about how they handled it. That was such a beautiful video. Way to go, Bella! It deserved a nomination but I won't even go into that. I'm sorry that you got mixed up in such a messed up process. Thanks for sharing the jumping video! It's a great video! So good to see a dog working and overcoming fears!